Still, the company isn’t giving up. This fall it brought out a radically revamped Apple TV at a much lower price—$99, down from $229—and with a different philosophy. While earlier versions contained a hard disk and allowed you to purchase and store movies, music and TV shows, the new Apple TV is all about streaming and renting. It can’t store content, although, like its predecessors, it can transmit to your TV screen content stored on your networked home computers. 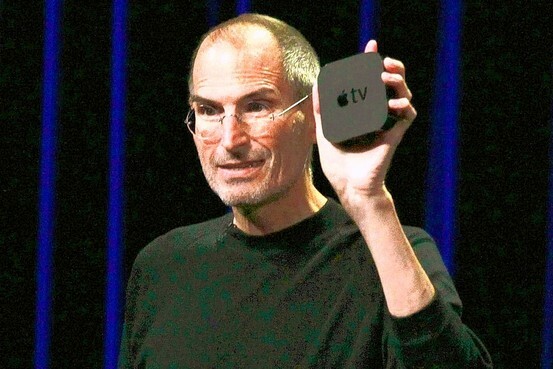 Apple’s Steve Jobs announcing the new release of Apple TV earlier this fall. I’ve been testing the new Apple TV, including trying out AirPlay using various devices, and found that it performs as advertised. It has a clean, easy interface, does a great job of streaming content from your own computers, and it allows you to rent TV shows at just 99 cents an episode. It’s even almost invisible next to your TV—a 4-inch-square black box less than an inch tall. And setup is easy. But it has some significant downsides. The most important of these is a very limited selection of Internet video sources. If you want a set-top box that allows you to watch a wide range of video from the Web, Apple TV isn’t it. Apple TV is now essentially a modestly priced adapter that streams video, audio and photos to your HDTV from three main sources: your own computers, Apple’s iTunes service plus a few other online sources, and content on your portable Apple devices using AirPlay. It’s the polar opposite of the new Google TV, which tries to encompass the entire Internet but is too complicated for mainstream users and costs hundreds of dollars. Apple is offering much less variety in content sources, but with a much simpler interface and a tiny remote with just seven buttons, versus the keyboard or minikeyboard used with Google TV. Apple TV is still tied heavily to the company’s own iTunes service. The new model now also offers Netflix, which is nicely integrated into Apple’s user interface, but is very common on other set-top boxes, including the less expensive Roku models. YouTube is accessible from the new device, though it was present on the older model as well. The device can’t deliver other video services, nor is it designed to bring up Web pages on your TV. You can still buy TV shows from the excluded networks, or shows unavailable for rental, on your computers and stream them to the TV via Apple TV, but that is a more complicated process. 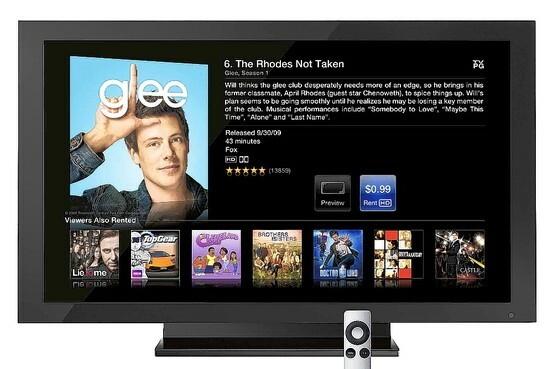 The Apple TV set-top box with TV showing 99-cent TV show rentals from iTunes. Apple claims the largest selection of high-definition movies online, and says many are available the same day they appear on DVD. Movie rentals start at $2.99 for standard-definition versions and $3.99 for high definition, though many are $4.99. Both movies and TV shows can be kept for 30 days, but, once you start playing them, the clock starts on a short window before they expire. In the case of movies, the window is 24 hours; for TV shows, it’s 48 hours. You can pause and resume, or watch them repeatedly, within those windows. In my tests, video and audio quality were excellent. Programs started rapidly, and I never saw any stuttering or buffering delays. Like the older Apple TV models, the new one did a very good job of streaming to the TV content from both PCs and Macs running iTunes on my home network. In fact, the process of setting this up has been made simpler. Watching slideshows of family photos was simple and rewarding. Searching for a TV show or movie was tedious, because it requires you to peck out letters from an onscreen keyboard with the little remote. (This is why Google uses a keyboard, but that isn’t a welcome device in many living rooms.) However, there’s an alternative. Apple offers a free iPhone and iPad app that can control the Apple TV, and it has a built in virtual keyboard for much faster searching. AirPlay worked well in my tests. I tried it on both an iPad and an iPhone, and was easily able to switch a video or song from the device itself to the Apple TV, and thus, to the TV screen and speakers. This requires merely clicking on an icon that looks like a wide-screen TV with an arrow beneath it, and then selecting “Apple TV” as a destination. I also tried AirPlay on both a Mac and Windows laptop using the latest version of iTunes, and it worked fine. On all the AirPlay-equipped devices, you can also multitask. Once you’ve started beaming a video to the Apple TV, you can do other things on the originating device without interrupting the video. For instance, as I write this paragraph in Microsoft Word, I am watching a video beamed to my TV via AirPlay from iTunes on my laptop. But AirPlay has some limitations. On the iPhone, iPad and iPod Touch it will only beam video to the Apple TV from Apple’s own Video, iPod and Photos apps, plus the YouTube app. On computers, it only works with iTunes. Some third-party apps on the hand-held devices can use it with audio, though not video. Also, switching the video stream to the Apple TV can take a few seconds, during which the video keeps playing, so you often have to rewind. Overall, Apple TV is a reasonably priced, well-designed device. It is especially attractive for viewing videos and photos from your computers, and Apple devices, on your TV. But it doesn’t deliver most Internet video sources, or even all online network programs. Find all of Walt Mossberg’s columns and videos at the All Things Digital Web site, walt.allthingsd.com. Email him at mossberg@wsj.com.